The nickname comes from my early Undergraduate days. But since I stayed with Plant Biology as a research field, I like it now. Hmm, got tired of "handles." I like being called by my name. Anyhoo, updates: Dec 2007, I'm now between 4-5k. New Favourite Tesuji: This reduction. Tetris on KGS first showed this in a review I was eavesdropping on and recently slade showed it to me quite extensively. I will place this on this site soon. 2nd Favourite tesuji: This crazy-seeming probe. 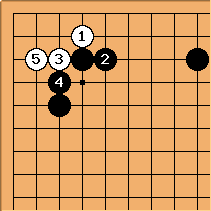 Yilun Yang (my favourite lecturer on KGS) calls this an asking move. 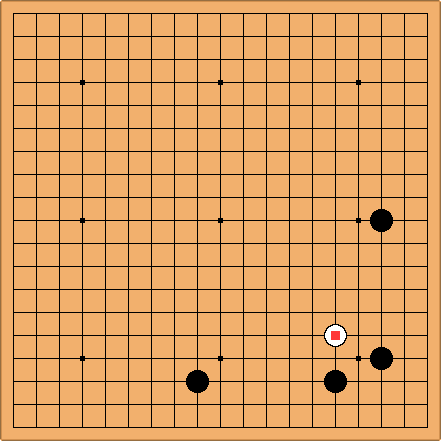 It "asks" black if it be allowed to live in the corner, or be sacrificed to reduce black. DJ: Welcome, Botany Boy%%% When you say "...extends to the side", do you mean as in the diagram below? If that sequence follows, you obtain the Tripod group, that is alive as it stands. Thanks DJ. Black 2 is certainly what I fear, but this makes it look easy. I wonder why I keep messing it up in games... No debate here that one must judge the board carefully before making this probe. What I love is the seeming audacity of the play and how it is so very labile in it's use. It is an inspiration for finding similar tesujis in other situations. Bob McGuigan: Try looking at Tripod Group to see what to do to live in the corner against various attacks. DJ: Actually you should judge the board carefully before living with this sequence, not before making the probe! 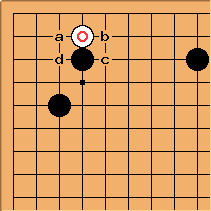 Here Black can answer at a, b, c or even d.
This is a very high-level technique, I think you can start really understand it at least around shodan... See Yosumiru.